It makes sense to set up charging stations in places where the vehicle is going to be for longer periods of time. Ideally, in a parking garage equipped with double parkers from Klaus Multiparking. “We are concerned with quality, flexibility and efficient use of the power already available on the double parkers,” says Thomas Baumgärtel, sales manager at Klaus Multiparking GmbH. 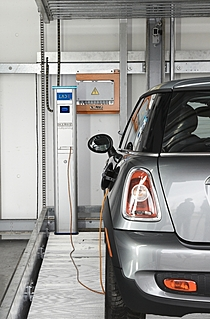 The 400 volt aggregate connection already installed on the double parkers can be used to feed the electrical charging stations, which then provide power for charging vehicle batteries. For companies located in Aitrach (Baden-Wuerttemberg), it is assumed that requirements for this will increase in the next few years. “According to the current prognosis, there could be 2.5 million electric vehicles in Germany by 2020,” states Klaus sales director Baumgärtel. Everything indicates that the trend towards electric cars will increase and development will progress quickly. “A decisive factor will be when there is a battery with a satisfactory price-performance ratio. 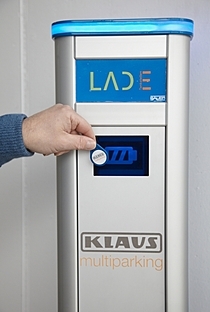 A limited range and long charging times are the last big problems,” says Helmut Knittel, one of the managing directors at Klaus Multiparking. It now takes several hours to fully charge a battery that is completely empty. 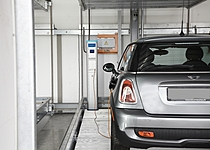 But Knittel is sure: “When the electric vehicle trend really gets going, we will be ready with innovative concepts and solutions.” The starting price for an electric charging station should be about 4000 euros. The charging station can then be accessed for example using a mobile phone: Users call the number shown on the charging station display and identify themselves for example with a PIN code. Another option would be a chip that is recognized and controlled by a reading device. “Billing would be possible via credit card or mobile phone,” says Helmut Knittel. Klaus will offer the charging station as an option for the double parker. “If someone decides on a double parker system without an electric charging station and wants to upgrade later, this can be done without problems – we’re fully prepared for this,” says sales director Baumgärtel. Double parkers from Klaus Multiparking have a long tradition. The parking systems have been manufactured by the family-owned company for more than 45 years. With a single or double platform, double parkers can be used to park two, three or four vehicles; with the G63 system, even between three and six vehicles. Depending on the model and possible construction dimensions, the parking systems have either angled or level platforms. Double parkers can be installed in underground garages, prefabricated garages and single or multiple family houses.